It is estimated that 80% of people spend less than 2 minutes selecting a mattress before purchasing it. Getting adequate sleep on a nightly basis is vital to ensuring that you are physically, mentally, and emotionally prepared for the day ahead. According to research performed by the National Heart, Blood, and Lung Institute, evidence shows that the average adult needs 7-8 hours of sleep each night to maintain their health and well-being. However, this sleep needs to be undisturbed which can be a challenge for those who suffer from lower back pain. Many people think about chiropractic as a great way to naturally treat back pain and symptoms (and it is! ), but did you know that chiropractic has many other benefits that have been shown in recent scientific studies? 5. Chiropractic Can Save You Money! 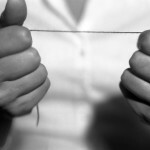 – Health care costs are spiraling out of control. With modern medical tests and expensive medications, it can be hard for people to afford the care they need. Studies show that seeing a chiropractor is much less expensive than a medical doctor, and with all the benefits of chiropractic, you can have better health without drugs or surgery, too! While most individuals are aware that chiropractic treatment exist, many people are not quite sure what role it can play in their personal health and well-being. Many insurance providers consider chiropractic care to be an “alternative” treatment—leaving many to turn to their general health care provider for all of their healthcare needs. If you are unfamiliar with chiropractic care and how it can be added to your healthcare routine to work in conjunction with your current methods of care, take a look at the information below. Whether chronic or occasional, neck and back pain can be quite disruptive to your daily routine. It can cause discomfort while sitting, standing, and sleeping, and can limit your range of motion. Receiving chiropractic care to address neck and back pain will ensure that your spine is in proper alignment—which reduces muscle tension and inflammation. Unlike turning to prescription pain relievers or muscle relaxers, chiropractic care directly addresses the root of your pain, and provide you with a natural solution that fixes the problem—instead of only masking the pain. Asthma and allergies often go hand-in-hand, but you can certainly have one without the other. Approximately 70% of all patients who have asthma, also has allergies. As allergy symptoms progress, asthma symptoms become more prominent. Chiropractic care can reduce or eliminate the need for prescription treatments for asthma and allergies by normalizing the flow of nerve signals, and reducing sinus pressure and pain associated with allergies. Chiropractic adjustments also help to boost immunity, which allows your body to fight off allergens and free-radicals that exacerbate allergies. Chiropractic care can be used to treat sports related injuries as the primary means of treatment, or in conjunction with physical therapy and massage. What many patients are surprised to find is that chiropractic adjustments can be administered in areas other than the neck and back. Adjustments can be administered from head-to-toe to treat sports related injuries that affect the ankle, knee, hip, wrist, elbow, and many other areas of your body. 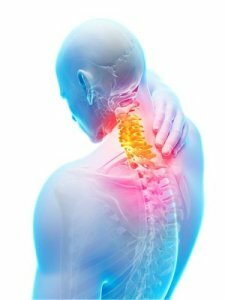 Unexpected accidents can lead to pain, inflammation and swelling throughout the body—particularly in the neck and back. Whether the accident is work related, a car accident, or a personal accident such as slipping and falling—chiropractic care can be utilized to treat the areas that are experiencing pain as a result of the accident. Treatment for accident recovery may be more frequent directly after the accident, then slowly dissipate as pain and symptoms begin to diminish. Many individuals are looking for ways to eliminate prescriptions and chemical-filled, over-the-counter health remedies—making chiropractic care an excellent addition to a homeopathic health care routines. Chiropractic care boosts immunity, reduces pain and inflammation, and encourages your body to heal itself naturally. The examples above are just a handful of the health concerns that you can turn to chiropractic care to treat. For more information on how you can benefit from chiropractic care—please contact our office today to schedule a consultation. Anderson Chiropractic Center is happy to offer state-of-the-art massage therapy. Receive a professional, customized massage from Amanda Lunn, our nationally certified massage therapist. Your health and wellness are important to us as we understand the significance of achieving a healthier and more balanced lifestyle. Make massage part of your wellness routine at our convenient Holly Springs location or give someone the gift of health with a gift certificate for massage today. Amanda is a consummate professional who lives right here in Holly Springs. She offers a variety of massage modalities and enhancements to help make your massage experience top notch. Whether you are looking for a Swedish massage, deep tissue massage, Thai massage, pregnancy massage, myokinesthetic session, or reflexology session, Amanda at Anderson Chiropractic Center in Holly Springs has you covered. She also offers decadent foot and back scrubs as well as aromatherapy and enhanced sessions with biofreeze. Achieving a balanced lifestyle can be hard, but we are here to help. Call Anderson Chiropractic Center now at (919) 552-0751 to schedule your massage today. Same day appointments are usually available with our professional staff. Anderson Chiropractic Center was proudly voted the BEST Chiropractor of Holly Springs, North Carolina by the Holly Springs Sun. The voting began January 2012 through February 2012 and was for the year of 2011! 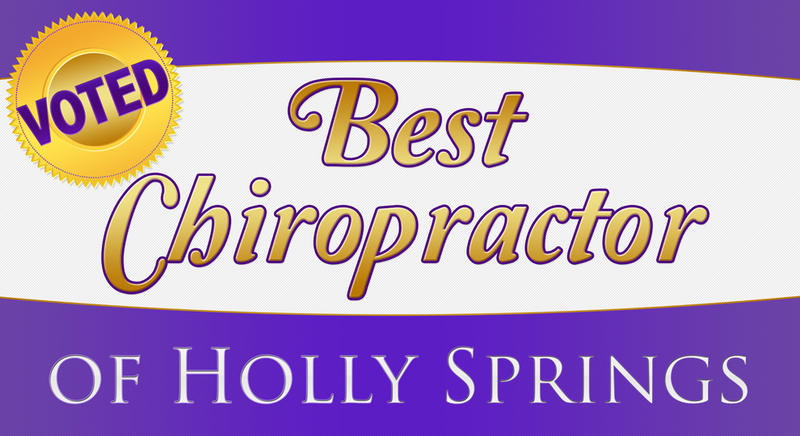 The people of Holly Springs, Apex, Cary, Fuquay-Varina and surrounding areas all voted us as the Top Doctor of Chiropractic in Holly Springs for that year. We want to thank each and every person who voted for us and we look forward to serving Holly Springs for years to come! We take the time to care of our patients individual needs and go the extra mile people. We provide ample therapies with each visit and incorporate BioFreeze in our Ultrasound treatments for ultimate back, sciatic and neck pain relief. We are the area’s premiere Chiropractic office located right in convenient Holly Springs, NC. People from all over the Triangle are able to see us because we are located very close to Toll Road 540, Highway 1 and right off the Highway 55 Bypass. Do you have unbearable back pain or a dull ache that will not go away? Have you tried pain pills, regular doctors who scratch their heads unable to find the source of pain or even gone to great lengths like surgery for help? Let Dr. Anderson of Anderson Chiropractic Center located in popular Holly Springs help you today! Dr. Anderson has hundreds upon hundreds of satisfied patients who turn to him when they have back pain. He treats muscle spasms, vertebral misalignments and other various causes of back pain. Our soft tissue therapies will relax your muscles and allow the adjustment to hold better. Afterwards our therapeutic ultrasound with BioFreeze will penetrate deep down into the tissues creating vibrations and heat that will break down and disperse unhealthy calcium and other hard tissue accumulations. The rise in temperature causes an increase in blood flow and relaxes muscle spasms which speeds up the healing process. Let our knowledgeable and friendly staff get you feeling back to normal quickly. 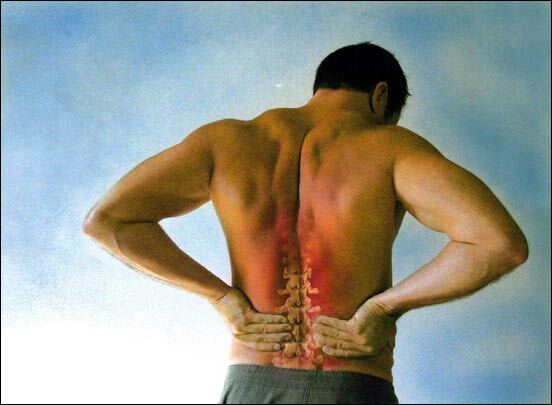 You do not have to live with cronic back pain! Our Chiropractors will treat you naturally with the latest in chiropractic techniques. Migraines can cause blurred vision, sensitivity to light, inability to concentrate, inability to sleep, irritability and other symptoms. Often people who work on computers or sit at a desk several hours a day, over time will begin having bad headache symptoms, often called migraines. Patients many times will come into Anderson Chiropractic Center with tension headaches caused by abnormal cervical posture. When you first come in for treatment of a migraine or headache Dr. Anderson will first give you a thorough examination, take detailed state of the art Digital X-Rays. Afterwards you will be given soft tissue therapies including electrical muscle stimulation with heat and a relaxing roller massage on our traction bed. Dr. Anderson will then examine your x-rays and show you any findings. He will then give you an adjustment which could include multiple regions (not just your cervical spine) like a thoracic, lumbar, pelvic region and sometimes even extremities. Try a professional chiropractor today. Get your neck aligned and headaches under control by coming into Anderson Chiropractic Center. Did you know that often after first being involved in an automobile accident people often initially feel no pain? After a few days, neck pain, back pain, whiplash and migraines can start negatively affecting the person. You may begin feeling disoriented, dizzy or even depressed. The nervous system is a powerful thing and car accidents can create an array of serious complications. Before looking for an auto accident attorney, visit Dr. Anderson of Anderson Chiropractic Center located in convenient Holly Springs, NC. We have successfully treated many patients involved in auto mobile accidents and allow the patient to complete treatment often without any money out of pocket until after the accident has been settled by the at fault party. The last thing we want to see is car accident victims located in Holly Springs, Apex, Cary, Fuquay Varina and the surrounding areas not seek treatment from a doctor who specialized in automobile injures. Soft tissue damage can have negative long-term effects and immediate treatment is imperative to preventing potential permanent damage. Come in for your free consultation and see if the professionals at Anderson Chiropractic Center can get you feeling better naturally though therapies and chiropractic adjustments. We will work with any auto accident lawyer you are working with or bill the at fault party and/or your personal MedPay on your behalf. We work hard to get you feeling better and doing all that we can to make your life easier during trying times such as these. 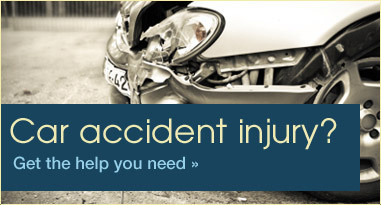 Before calling a personal injury attorney call the TOP personal injury doctor in Holly Springs, NC. We’ve had patients as far as Raleigh seek treatment from us because they wanted only the best when it came to their injury care.